Personality: A cunning and deadly tactician, Saris rise to power is anything but a story book success. He's a man of finesses often times harboring his abilities to appear weaker or less capable that he appears. His menacing and often times calculated ambushes of his opponents have earned him a much deserved ruthless reputation among the New Republic and Empire Remnants alike. In a organization like the Empire, ones ability to manage the complexities of civilian leadership and that of a robust military industrial complex usually sees one traded for the other. Saris has all but master the mantel of leadership for both in his sector, ensure the loyalty of his subjects with the faithfulness of his armed forces. In short, Saris is a vile and toxic person who's smart enough to know he doesn't have the resources to be a unifying force for the Empire, but strong enough to impose his will on those weaker than himself. With nothing to really tie him down to a set or morals, his candor when ordering such atrocities as the one on his homeworld tell mostly anyone that the young imperial isn't someone you come to the table with with trinkets. Lightsaber form(s): Saris practices a melee sword fighting form native to his homeworld, but nothing standard to what is used for the effective wielding of a light-saber. Unlike what one might expect from a planet loosely associated with the Empire, Cassander is a female dominated feudal societal system were women are simply held in and treated with more respect and prestige than their male counter parts. Most men where used for defense of the system offering a truly dedicated and larger pool of resources for military and economical might. Women were developed as the leadership caste of society, serving the the most senior roles of government and the military to advance the projects and policies of their people. Saris could have considered himself one of the lucky ones, as the first born to the Empress, he was afforded respect, but nothing much more than that. His hatred for his birth-sake and nothing more than the son of the Empress earned them the highest honor any man could receive in their life, a star-ship command in the defense forces of Cassander. The women who served below him did often times snicker and give the Prince a undue hard time for being privileged enough to sit in command. His protest to the effect where often ignored by his mother who side that his place was very much leading the men of their society, not ordering women around. If Saris felt marginalized by his own military, then the birth of his sister all but sealed his fate, and that of his people. Being a female, Saris sister passed him in the line of succession to become the Crown Princess of Cassander, leaving her bother to only marry a noble women of his sisters choosing to strengthen political power of the bloodline and align houses to that of their own. It was here that Saris realized the most he'd ever amount to, the most he'd ever become, was a pawn to be used by his sister and mother. Then came the Empire. Initially, Saris was ordered to stay out of the fighting that ensued from the invading army and storm-trooper corps that leveled the outlaying worlds of their system. His mother, leading the fleeted against the powerful Grand Moff Jaffer, would be executed once her ship was captured and boarded. Leaving Sari's sister to take the crown and throne. In a effort to save her people, the new Empress vowed to serve as a loyal subject of the Empire, thus ending the war and allowing the near-complete reformation of her system military and economic resources to fall to the hands of the Empire. It was as if things changed overnight. Imperial propaganda was everywhere. Their fighting forces now wore the uniforms of the imperial army, navy and stormtroopers. Most noticeable was the presence of men in areas of the planet and cities that never had them before. It was the perfect storm for Saris and his sister. The men of the society truly enjoyed their newfound...freedoms, while secretly waiting to see Saris on the throne. The people of the sector were beyond upset with the royal family caving in to the Empire, even some women now supported the ousting of the Empress for her lack of resolve. It was Saris who knew this all could go in one of two directions. Either his system would began to secretly support the rebellion coming to his system to run off the Empire, or his sister would come to her senses and try it herself. 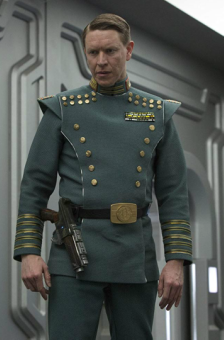 Rumors began to spread and in what Saris now realizes was his greatest political move as a imperial governor, he ordered COMPNOR to his system to eradicate the desertion in the ranks of both the civilian and military. The public executions at the hands of the most fervent supporters of the Empire was beyond anything anyone could have imagined. They blamed the Empress for all the death and suffering and openly invited the rebellion to try and save them, which they did...try. Tasked by the Emperor himself to root out all instances of the Rebellion from his system, Saris made a man for himself hunting down rebel sympathizers in the outer systems of the sector. These victories earned him the Moffship of his home sector and the condemnation of many of the women of his planet. Something that would never be lost on Saris for as long as he lived. The death of the Emperor provided him with a unique opportunity, if done correctly to cement power in his sector indefinitely. The plan started with the release of all political prisoners of the Empire. Most of the female leadership that worked with the rebellion or members of it. Promising his people a new beginning, Saris reinstated his sister as head of the sector and ordered that direct communications be started with the New Republic in haste. All of the political leaders in service to his mother and now sister agreed and set out to began negotiations with the New Republic. In a single day, Saris wiped out all of his political opponents, killing his sister in cold blood before thousands, ordering his imperial naval assets to destroy the ships leaving to make contact with the New Republic, and forming death squads out of his Storm trooper legions to kill virtually anyone who has ever went against him and his new rule. The men serving under Saris were especially hateful, doing untold things tho the women who were once their superiors. Saris watched his home planet from the stars burn for days with the destruction of his troopers marching and killing in support of him. A warlord in title, Moff Jolan Saris now commands a extensive swath of imperial resources that blindly do his bidding. Equipment: Almost everything that Saris owns is standard imperial issue. Weapon(s): A blaster is all one really needs when you have armies are your beckoning. The Allegiance-class battlecursier Tyrannic is the flagship of the Cassander Sector fleet and the personal ship of Moff Saris. Droids/Personnel: The Cassander sector includes twenty-four Star Destroyers, 1,600 other warships, and 800 support ships, while the field forces of the Cassander Sector Army number 774,576 front-line troops, and a little over 400,000 support personnel, to say nothing of the dozens or hundreds of planetary garrisons—usually small Stormtrooper brigades commanded by Major Generals. Other notable possessions/equipment: Nothing at the moment. Roleplaying Experience: Nearly 15 years. You and the Force: I'm one with the force.